Toronto, ON-based melancholic rock folk act Octoberman had a big year in 2008, touring North America and Europe, playing a ton of notable music festivals and still riding high on their full-length, Run From Safety. And it seems that 2009 has the potential to be just as awesome for the band, as they've just announced that their third full-length album, Fortresses, will be released by White Whale Records on September 1. 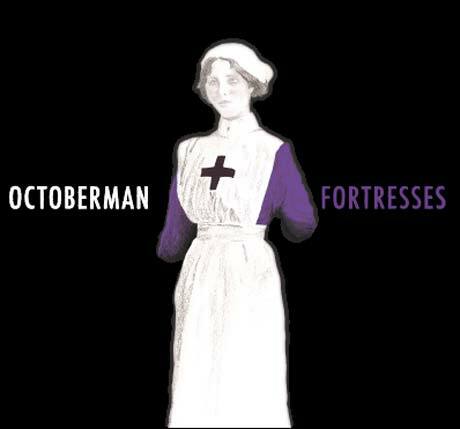 Recorded in both Ottawa and Portland, Fortresses is a big one for Octoberman, featuring the production work of Dave Draves (Julie Doiron) and Larry Crane (Elliott Smith, Cat Power). Channelling Richard Prince and Sonic Youth for the record's cover art, the release will be followed by a succession of Canadian live dates this fall, first out west and then east. To add to the excitement of the Canadian tour, the band will also make a big stopover for American fans in NYC to play this year's CMJ Festival. 2. "Dancing With Yer Ghost"
3. "Trapped In The New Scene"
4. "I Know A Nurse"
6. "Temptation Is A Bloody Mess"